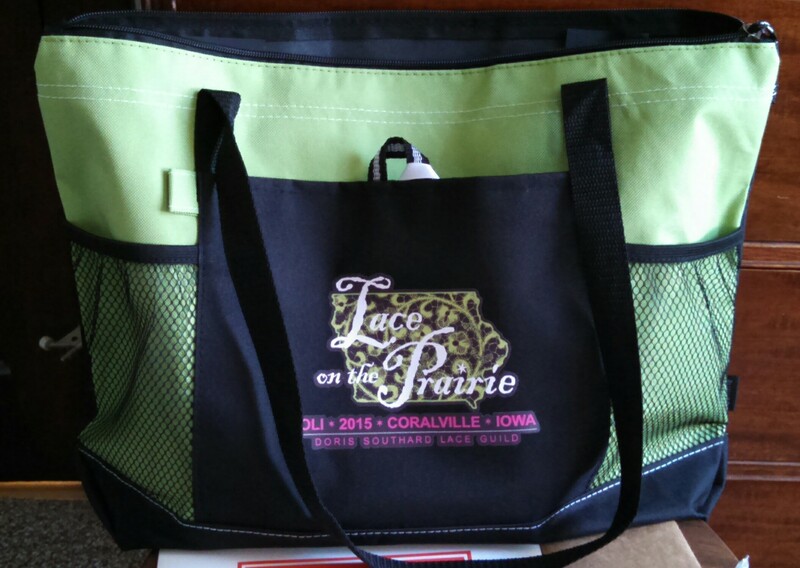 IOLI Convention is almost here! 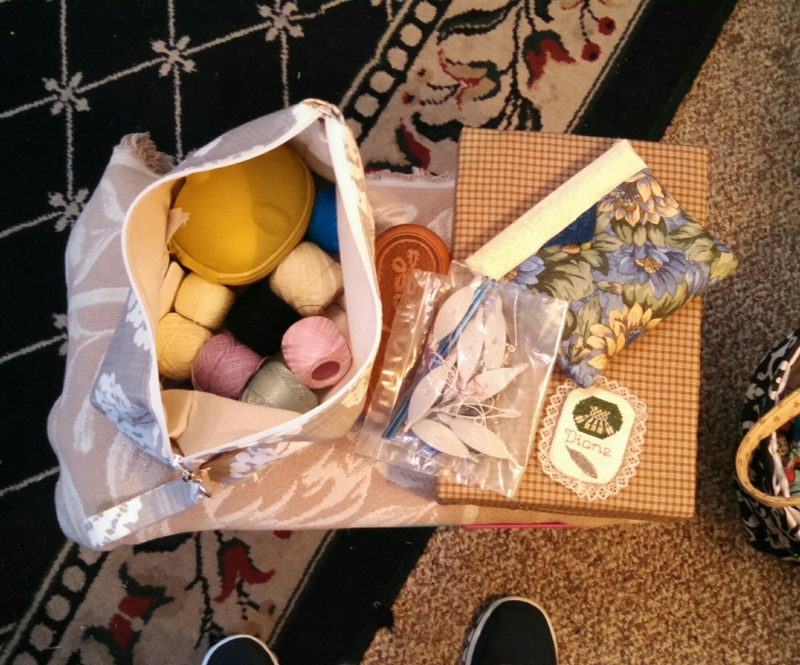 Got all the supplies packed for my pearl tatting class. Got a week’s worth of clothes & lace finery packed. Picking up money on the way out of town. 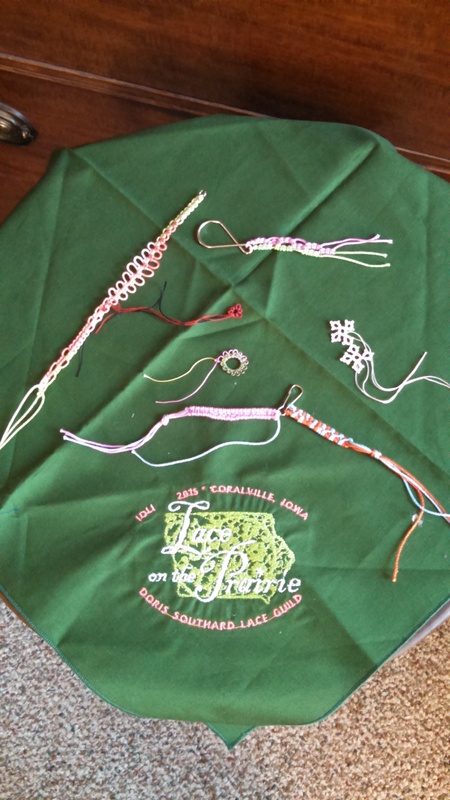 Hubby is driving me to Coralville, IA for the annual lacemaking convention, this year hosted by the Doris Southard Lace Guild- of which I am a member. There will be classes, lectures, vendors, exhibits, demos, and reuniting with friends. The best part is spending a week with people who share the same passion and interest in a topic. It’s coming to the end of the second week and I wore something hand made each weekday, without duplicating anything so far! 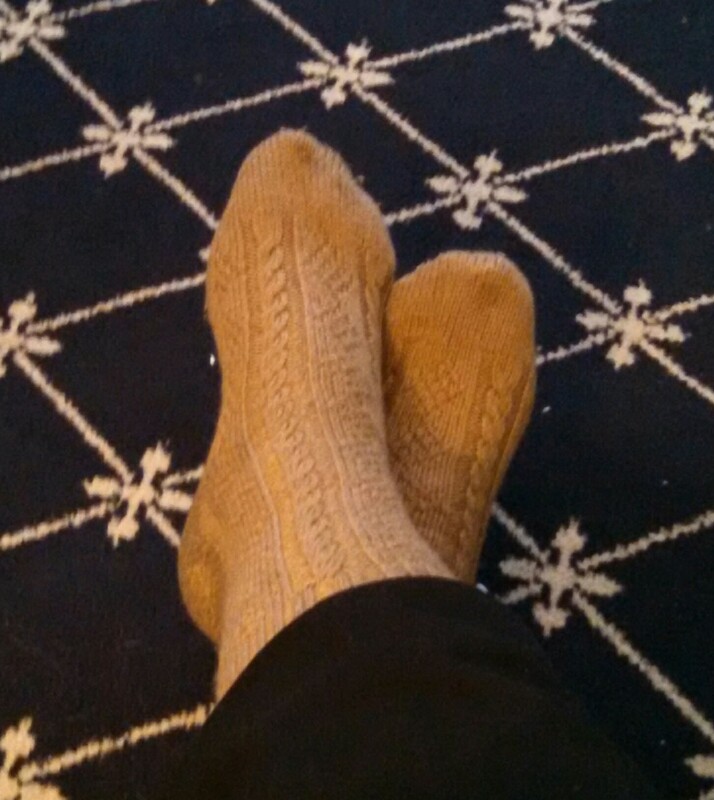 Monday, May 11 – Filey socks by Ingleside Belle. 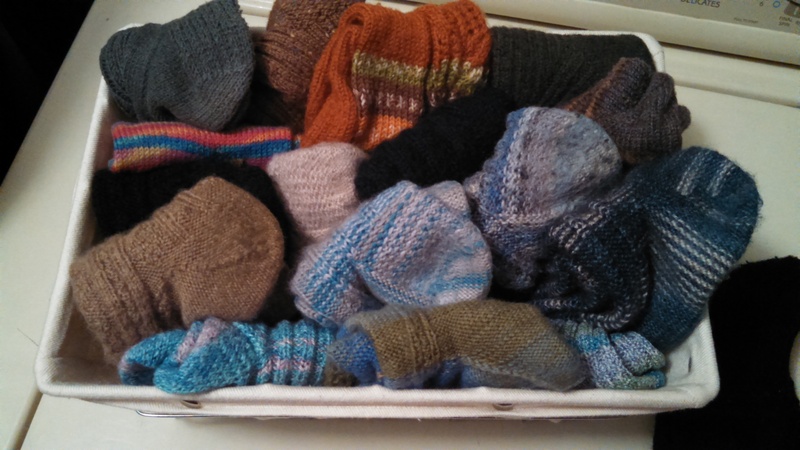 This is one of my favorite sock patterns, truly a unisex pattern. I’ve knit these for both my husband and myself. Tuesday, May 12 – Verdant shrug by Gina Bonomo. This was a great use of mystery yarn that was in my stash. I wear it to work, and I wear it over my jammies. So useful and comfy! 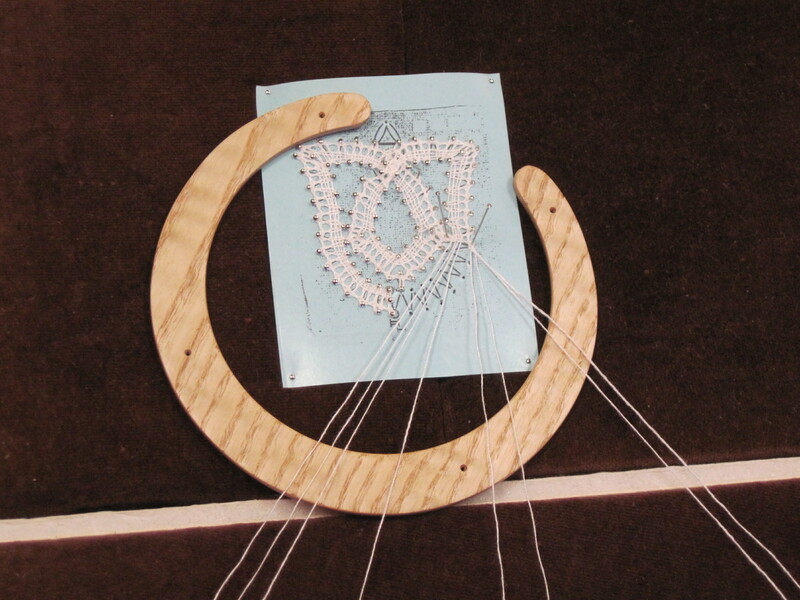 Wednesday, May 13 – ‘s Gravenmoerse bobbin lace pendant and bracelet. Just like the gold one I wore last week, but this on is in blue. I especially love the bracelet. Thursday, May 14 – Lily of the Valley Estonian scarf by Helen Wallin. 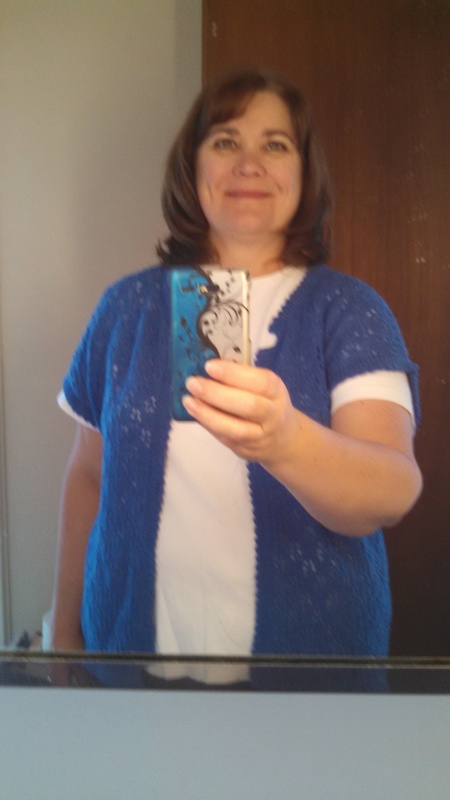 I knit this in 2009 to wear to the IOLI convention that year. One of the first lace knitted things I made. 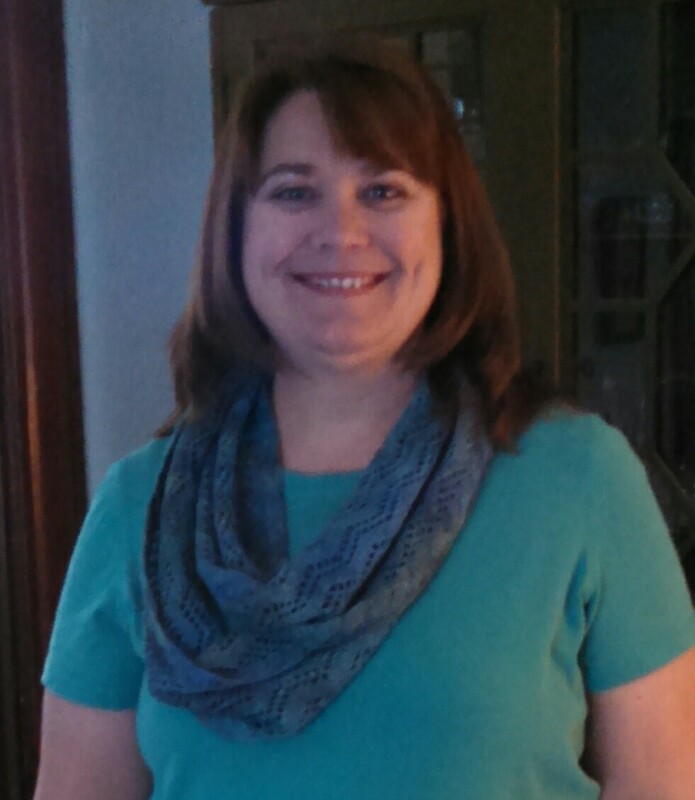 Friday, May 15 – My favorite blue scarf. You have seen this one on here before, but I can’t resist it. The color is so cool and calming and yet summery. 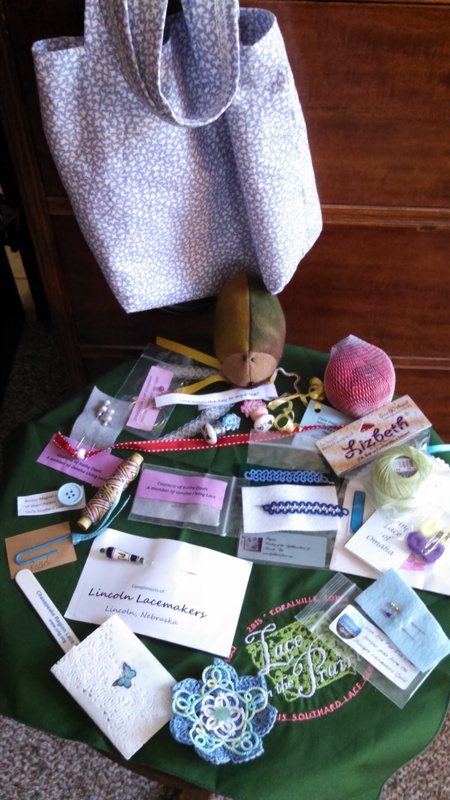 I’m participating in the Me Made May challenge with the Yarns at Yin Hoo podcast. The first week went pretty well and it was fun. I looked at my things in a new light. Friday, May 1 – Rusted Root, knitted in 2009 with Knit Picks Cotlin yarn. My first attempt at a pullover. 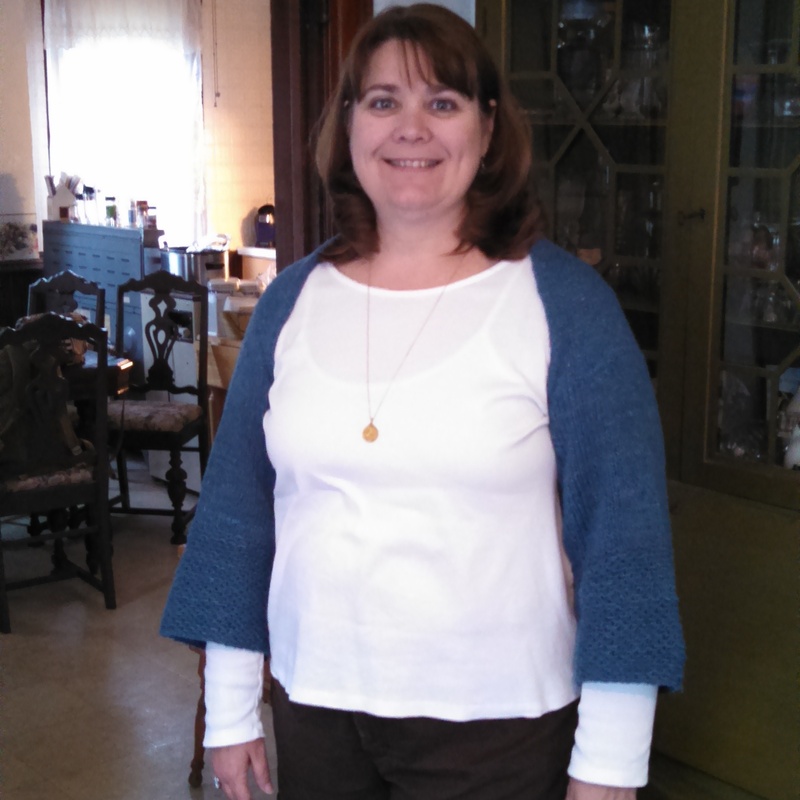 Monday, May 4 – Meadowlark by Amy Swenson, knit in 2014 with Trendsetter Yarns Cash Woole. It didn’t fit until I lost 50 lbs. Still could stand to be blocked out some more, but I like it. 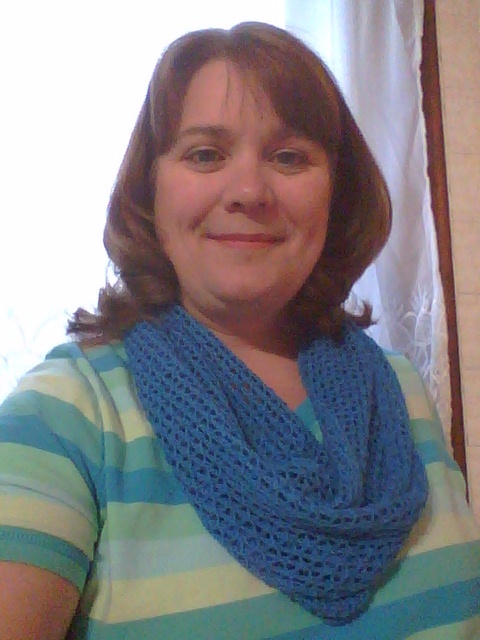 Tuesday, May 5 – Starlace Infinity Scarf by Pearl Morgan. 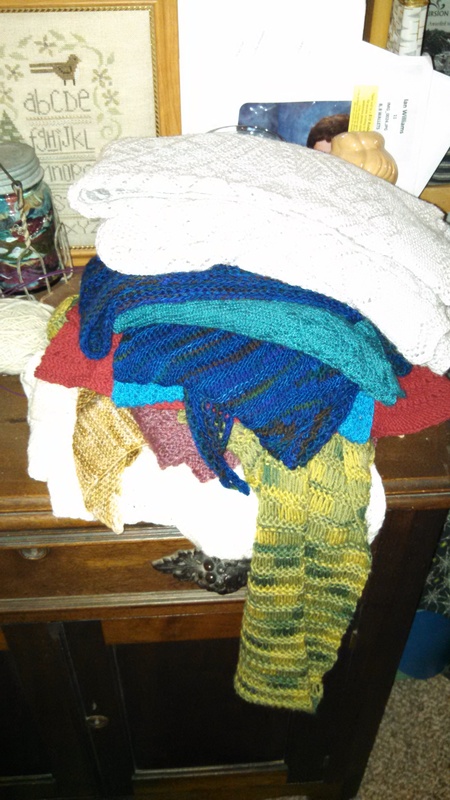 Knit in 2013 with Bijou Basin Ranch Shangri-La that I inherited from my mother-in-law. 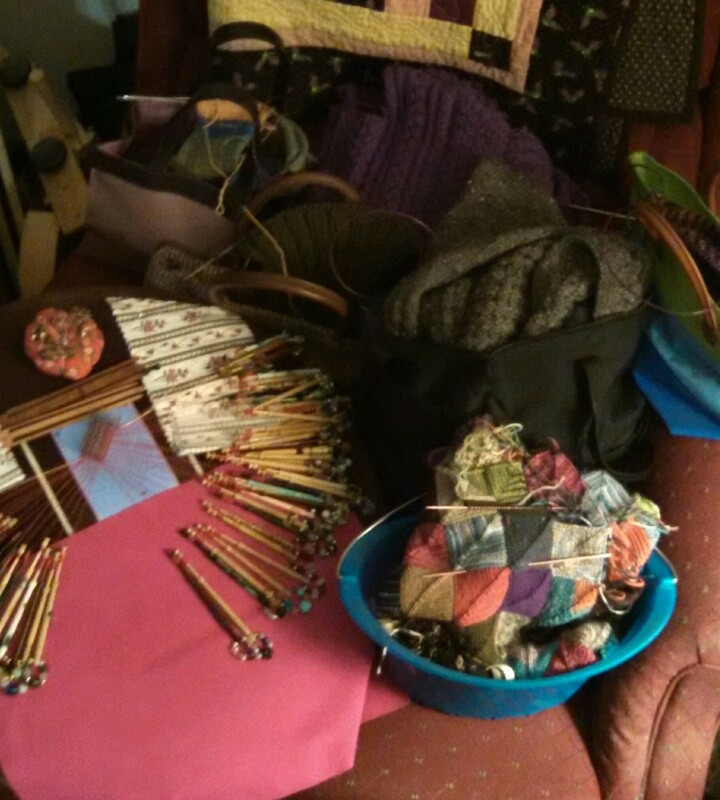 She bought the yarn and discovered she doesn’t like knitting with laceweight yarn. 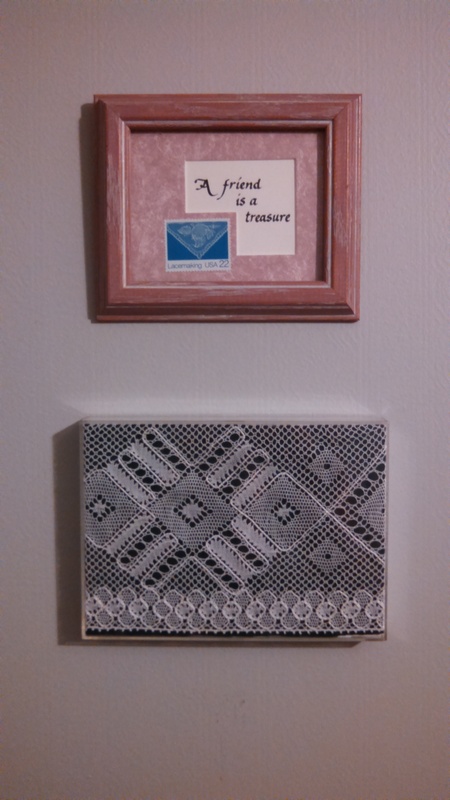 I encourage her to buy more laceweight! 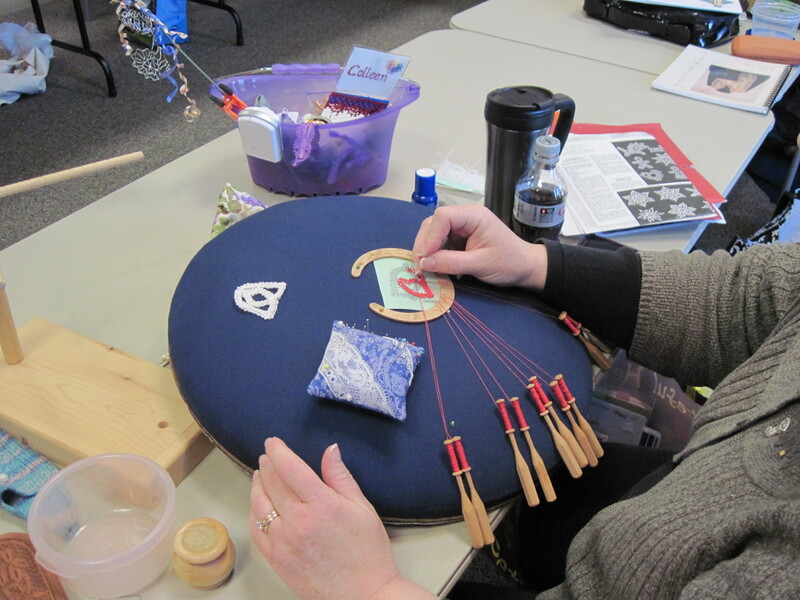 Wednesday, May 6 – a ‘s Gravenmoerse bobbin lace pendant. Not sure what year I made this, probably 2009. I get out of the habit of wearing my lace. 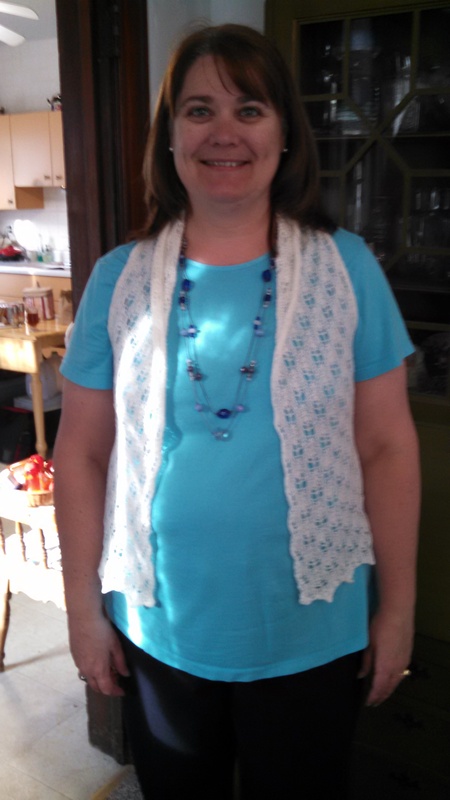 Thursday, May 7 – Vintage Vest by Linda Burt. 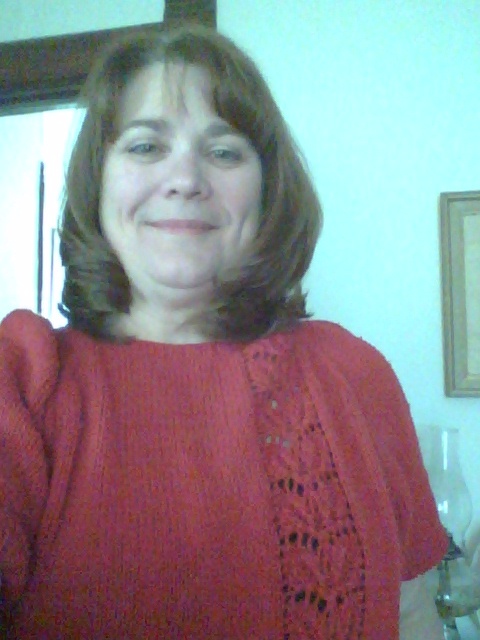 This was knit in 2010 with Red Heart Sock & Sweater yarn. I don’t like the goofy thing going on with the notches, but I really like this vest and get a lot of wear from it in the summer. 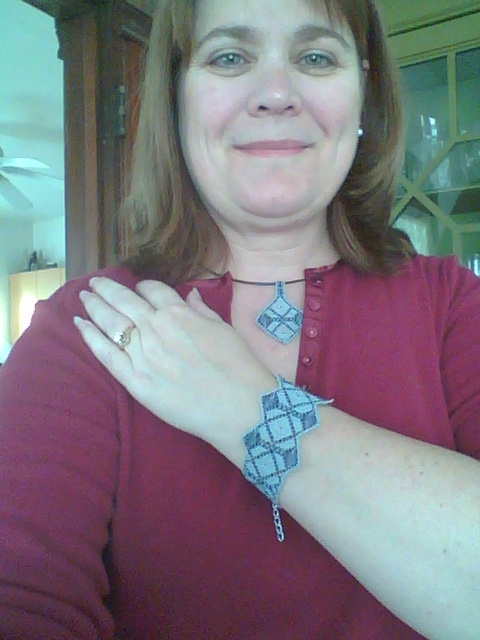 Friday, May 8 – Tatted Celtic Knot earrings. Love these! Wear them all the time. There is a thing going around some of the sewing blogs where people use the month of May and wear garments every day that they made. 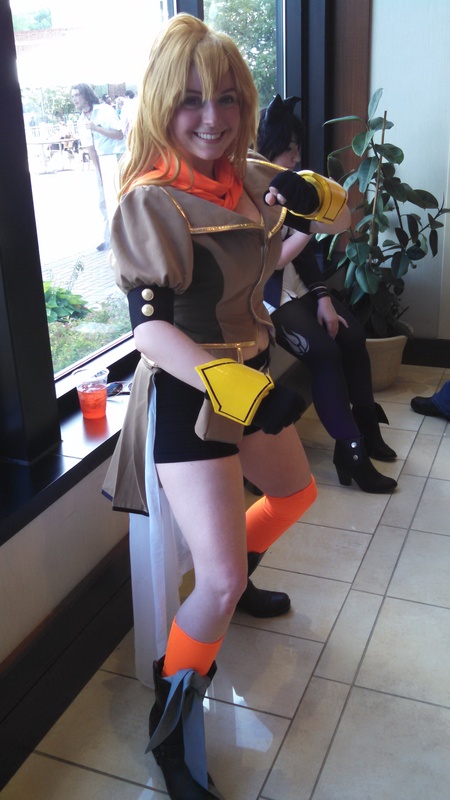 I am going to try this, but my goal is to wear “something” I have made each weekday. I don’t sew garments, but between my hand knits and some of the lace jewelry and accessories I have this might be possible. We will see! Here are some of the things you might see in the next month. I am reacquainting myself with all my current works in progress and worked a little on each of these today, some more than others! Can you believe while I was working on these I was planning several new projects? Yes, it’s true! I want to knit another baby sweater and would like to have some Orenburg lace on the needles. 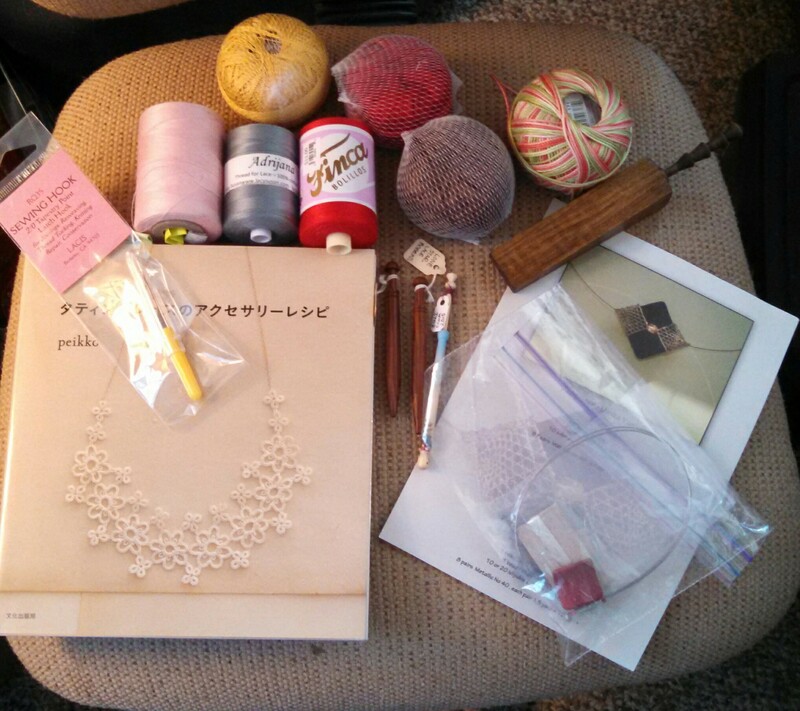 This weekend I have some tatting planned – my little tree needs a longer garland. It is going to be a good year! 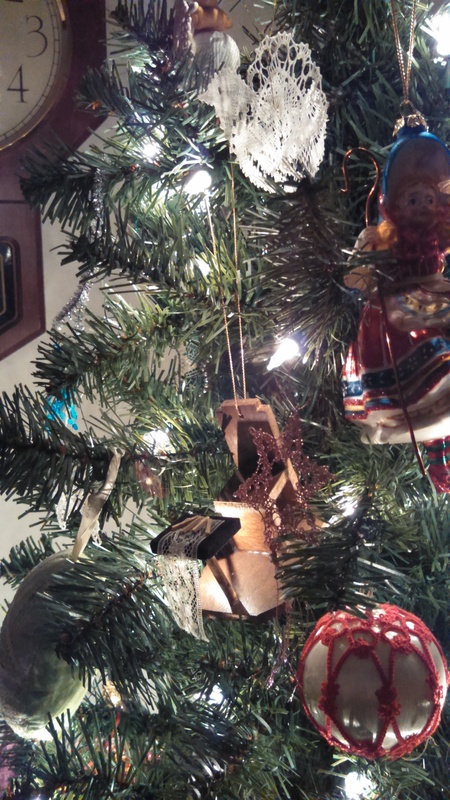 Here are some of my lace ornaments on the Christmas tree. 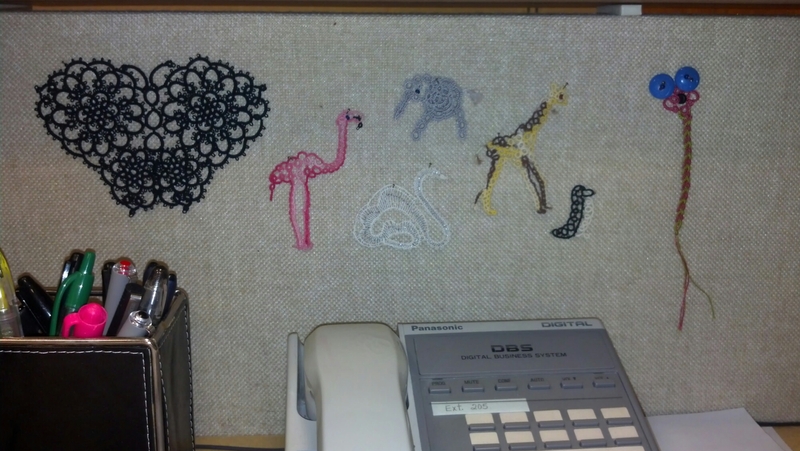 Just thought I would share some if my lace that I use to decorate my cubicle wall. I used to change it out, but these pieces have been hanging for quite a while. 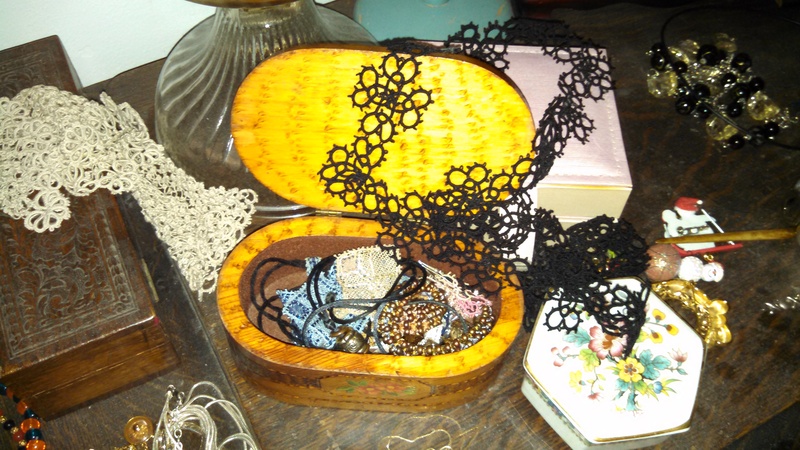 The large black tatted butterfly was copied from a piece my mom picked up in an antique store. 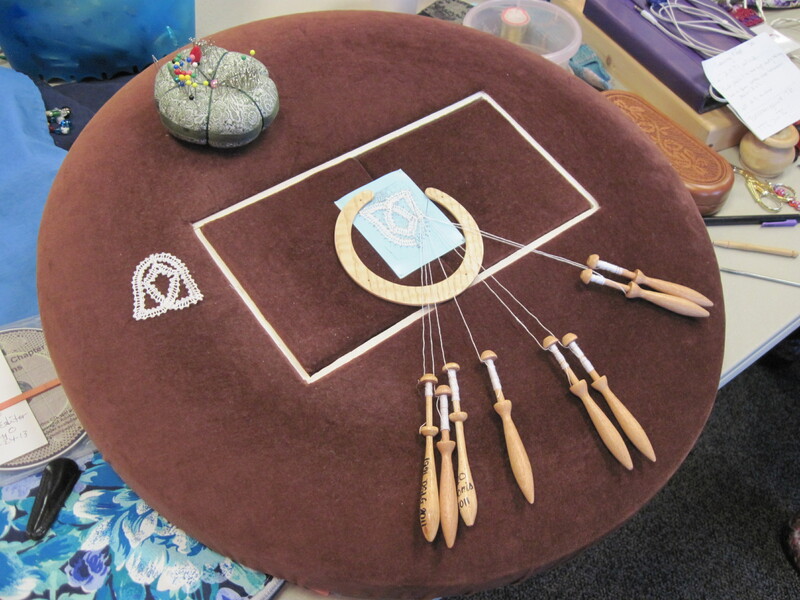 The small white swan is bobbin lace. 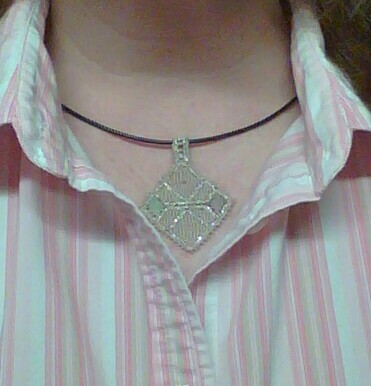 The pattern is Schneeberger and I got it from Lisa Baumeister many years ago. The tatted penguin is my own design. The other tatted animals are from Jane Eborall’s website. I especially love the flamingo and the giraffe. Got home yesterday afternoon and am enjoying a snowy Veterans’ Day at home while I put all my stuff away, smile over my finished objects, and wind more bobbins. 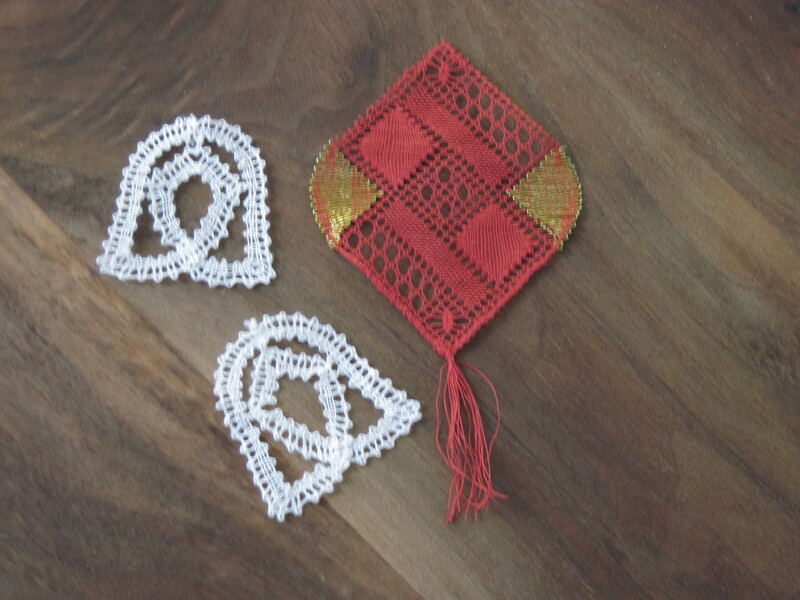 I finished 3 Christmas ornaments: one large red bauble and two small white bells. The red one was started back in August at the last guild meeting I attended and I didn’t touch it again until the retreat. But it’s finished, I love it, and I just wound bobbins to make it again. This time I’m going to change a few elements. 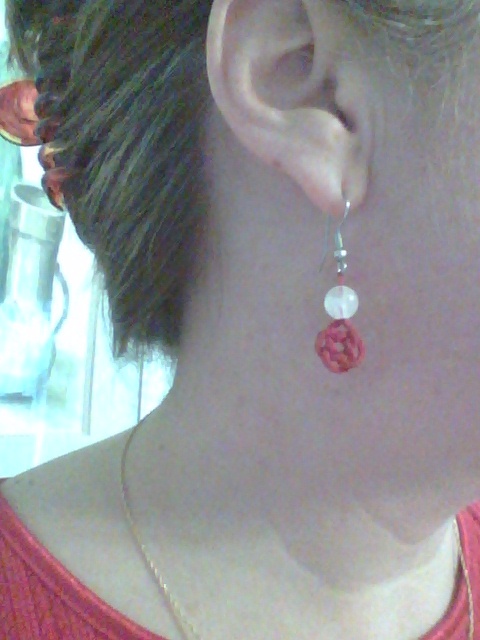 I love the little bells, I’m going to sew on a bead or two for the clappers since I wasn’t in the mood to make a tally. These turned out to be great teaching lessons for my friend Colleen and she turned out 3 of them (2 white and 1 red) during the weekend! What an accomplishment! 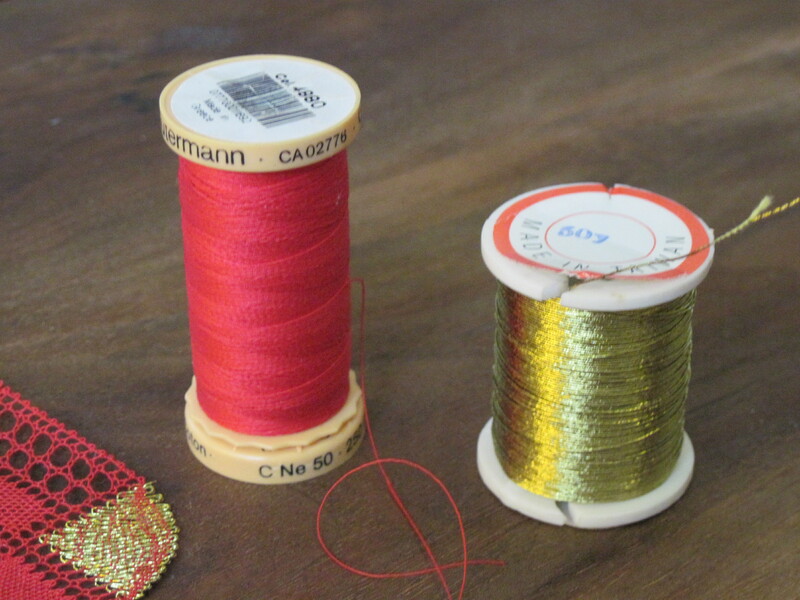 The red bauble took 30 pairs of Guterman size 50 sewing thread and a mystery gold metallic for the workers in the fans. The white bells were made with 4 pairs of Bockens 36/2 linen. The Shalom Center in Dubuque is a great place. The rooms are comfortable, the food is excellent, and the conference room is spacious with lots of light. There were 14 of us at the retreat. Most were working on ornaments. It’s always fun to get together with people that speak the same lace language! It’s something I look forward to every year.